Harmony Road Studio: snowmen on my table??? Hi all. I have been one busy chick this last couple weeks. Last week I was a bit draggy but this week is whipping by and I am getting lots done. You are probably wondering about the title of this post but I assure you you will see why in a moment. First of all I finished my matchbox for the FlickR Monthly matchbox and this month Gail chose the theme of book or books. So I got Miss Peach as my partner and I messaged her to find out what types of books she liked. I was given a list so I had no reason to get stuck on any ideas. So I found out that Miss Peach loves Beatrix Potter so I searched the internet for illustrations and made a little book for her. I am not showing all the pages but I am giving a little sneak preview in case she comes over to take a peek. I certainly know whenever someone tells me not to peek I do, it's better you tell me it's in the mail and wait or I go a lookin. he he, can't take the kid out of me. 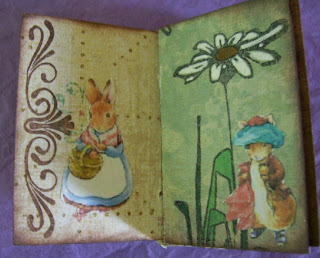 So here is the little book, remember it fits on top of a mini matchbox so there wasn't a lot of room for many pages but I did use stamps to decorate the pages. I hope Miss Peach likes it, and of course I filled it with some goodies and I have some extras that just won't fit so they will be on the way to the US in the next day or so. Below is one of the inside pages. I bound my book with embroidery thread and tied it neatly to the side. I had all the pages lined up before I did this and somehow they ended up being a bit wonky. Oh well I never said I was a book binder or whatever you call it. This was fun, I got to use a lot of my miniature stamps for this project. And here is what I have been doing, making Christmas ornaments for my fall shows. So far I have 2 that I will be submitting my painted items to and the third show is at the local Sweet Sentiments scrapbook store where the lovely Laura and Krista take good care of me ordering supplies and helping me with stamping and other things that I need help with. So here are the ornies I have had on the go. Mr. B cut them all out for me and then I took it from there. I still have more to do but this is just a small number so far. 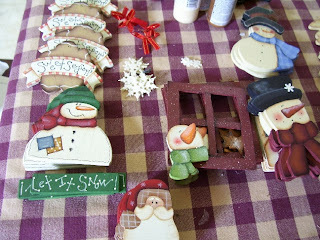 As you can see they still need to be varnished and little embellishments to add, ribbons, snowflakes, rusty stars and their hangers but when I get this lot all painted I will stop and do that before moving onto the next bunch. I like to get the things painted then do the other boring stuff at one time otherwise I will leave it to the last minute. You might have already noticed I like snowmen, but, I am doing some gingers, cats and a few painted paper ornaments soon to be on the go. Can't wait to do those. I finally found the Diamond Dust with a coupon at Michael's and I have since found it at another craft store out of town. After hunting online for it I found out Michael's sold it so with 40% off that made Lesley a happy painter. Well that's it for now. Garden is going to be harvested soon. Potatoes will be dug up. Beets are waiting for MIL to pickle them. I did a whack last year so I don't need to do any this year and the tomatoes are divine. Take care, thanks for stopping by and stay tuned for more painting goodies. No doubt about it, Les, Miss Peach will absolutely adore your box! I love your little book! 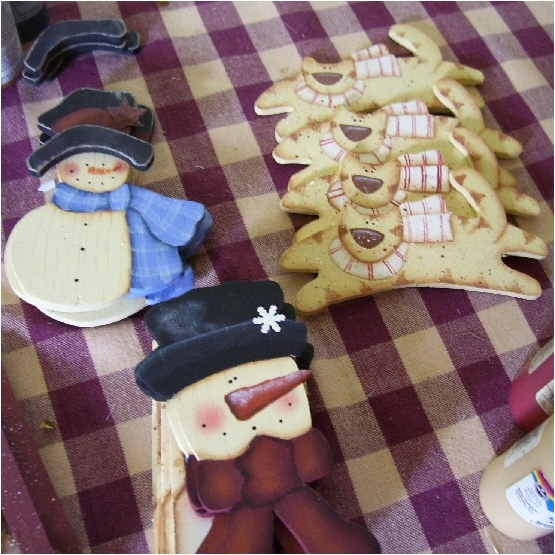 And those xmas ornaments are going to sell like hot cakes! How precious your littl matchbox is! Miss Peach will be thrilled!!!! Wow these are all so gorgeous!! Really great ornaments! Love the little Peter Rabbit book! Les, your ornaments are beautiful! Love that little book also! You are well on your way to stocking for your shows! Love your little book and all the ornaments. Wow!! You've been a very busy girl LOL. They look fantastic as usual Les. Keep up the great work! Adroable little book! Your ornaments are so sweet! I keep wanting to get back to painting, but the rubber and ink thing has taken over my life! Enjoy your harvest! I love the tiny book you made! Good luck on your shows. I used to do them (painting as well) many, many moons ago. I can not find you email to send me your mailing addy. 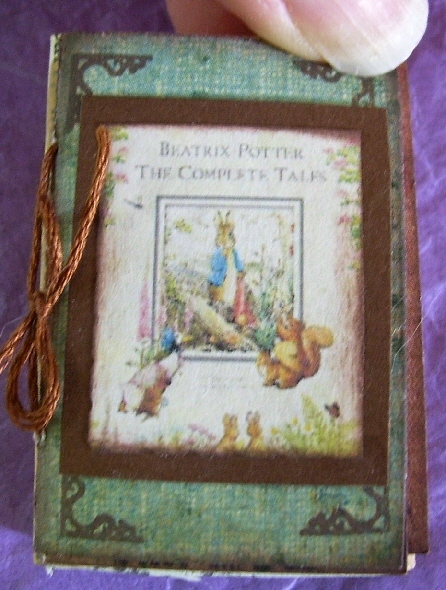 Gorgeous tiny book and I love your ornaments! Good luck with your shows.